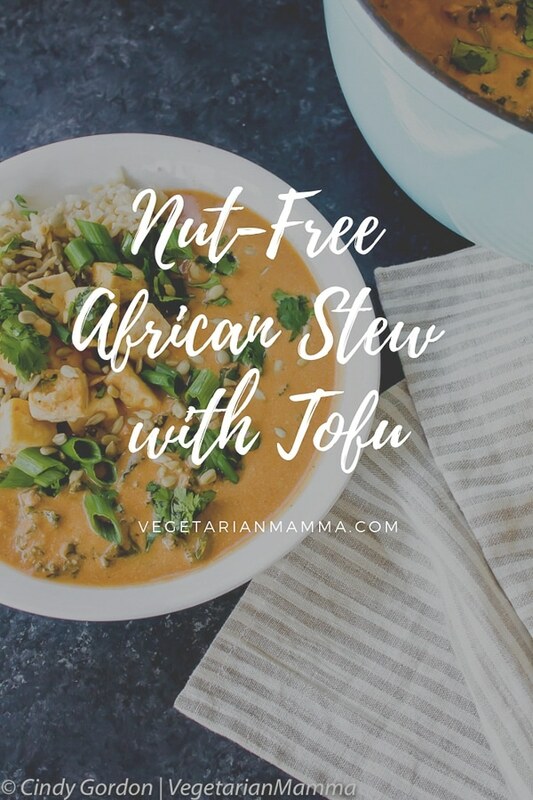 Nut-Free African Stew with Tofu is a play on traditional peanut butter soup, only without the nuts! With the use of SunButter this soup is transformed into something even more delicious than the original. This post is sponsored by SunButter. The opinions are my own. As the temps dip down in the negative numbers, I always reach for a soul warming soup or stew to hit the spot. There is just something about the steam from a warm bowl of soup that comforts me. Do not get me wrong, this soup can be enjoyed any time of the year! 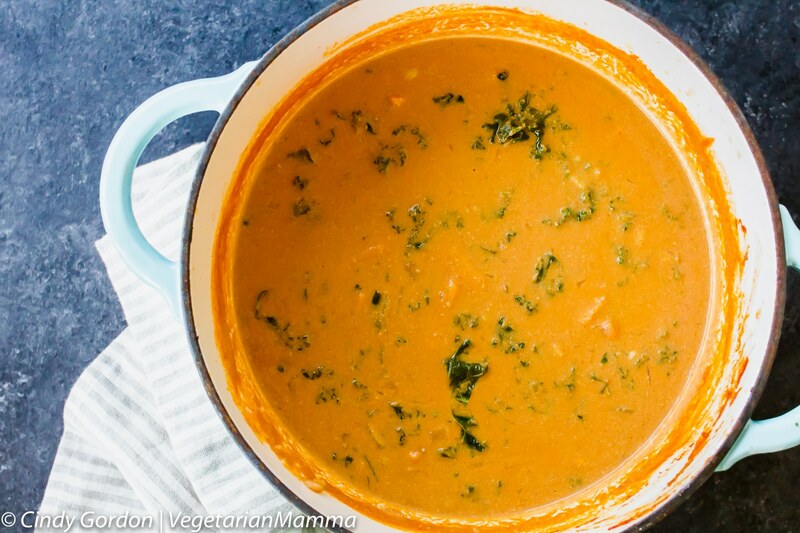 This NUT-FREE peanut butter soup can be enjoyed any time of the year! 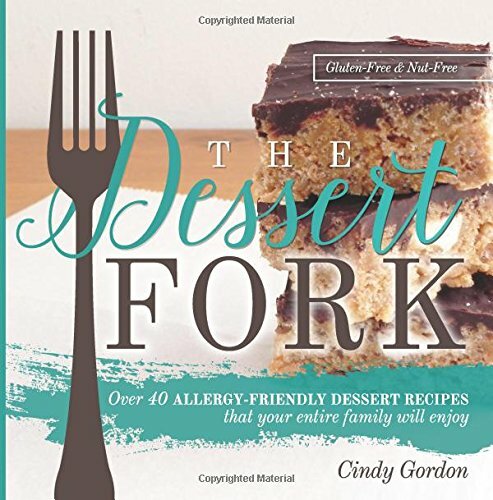 I have found that in the food allergy community, we always seem to have a play on words. 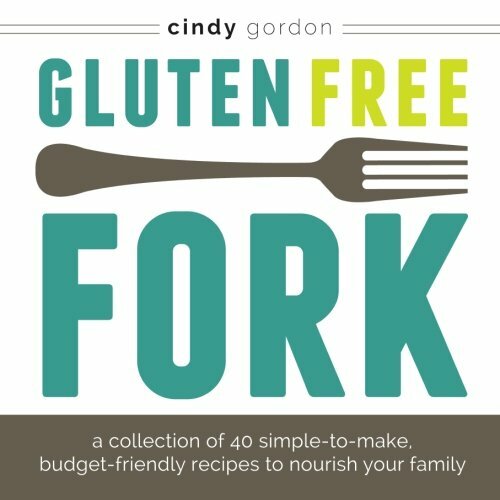 Things like “Nut-Free peanut butter stew” for example. We obviously know there are not peanuts or peanut butter in there but we use the words as a describer phrase. Very similar to “Vegan Tuna Casserole”…we know that there is not any fish in the recipe because the phrases uses the word: Vegan. But we still use the word “Tuna” as a describer. I think you get me, yes!? 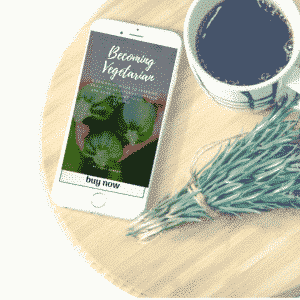 Often times when we think of sunflower butter and its alternatives, we do not typically think of savory foods. With this recipe, we are rewriting the rules. 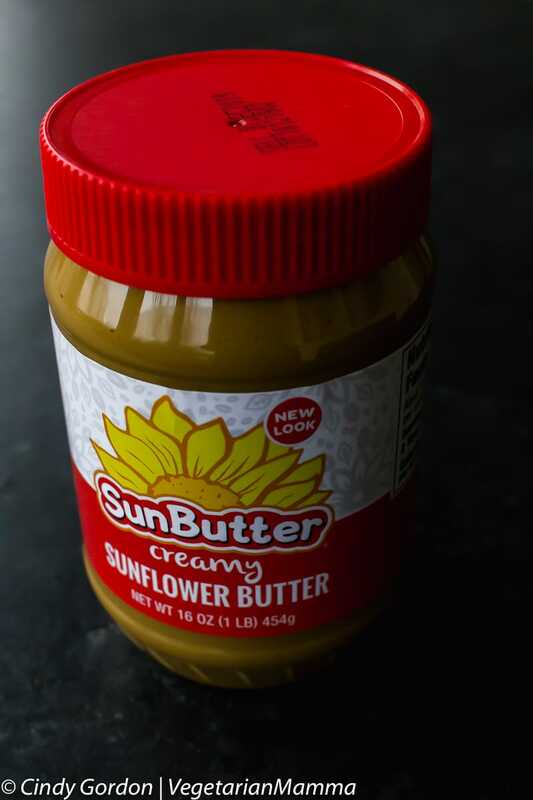 Sunflower butter isn’t just reserved for sweets anymore. SunButter isn’t just for sandwiches anymore! 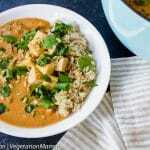 This groundnut stew is actually completely nut-free and is an adaptation of African peanut soup. 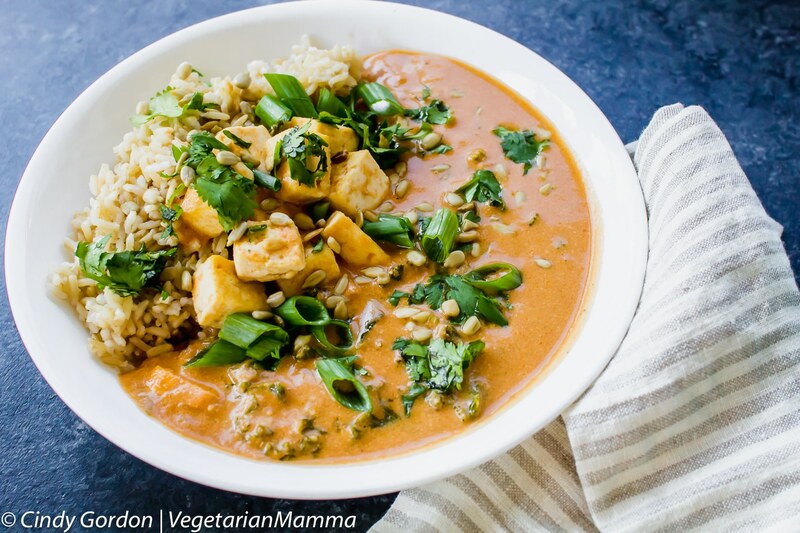 We have taken the inspiration of West African Peanut Stew and adapted the flavorful stew to make it nut-free! 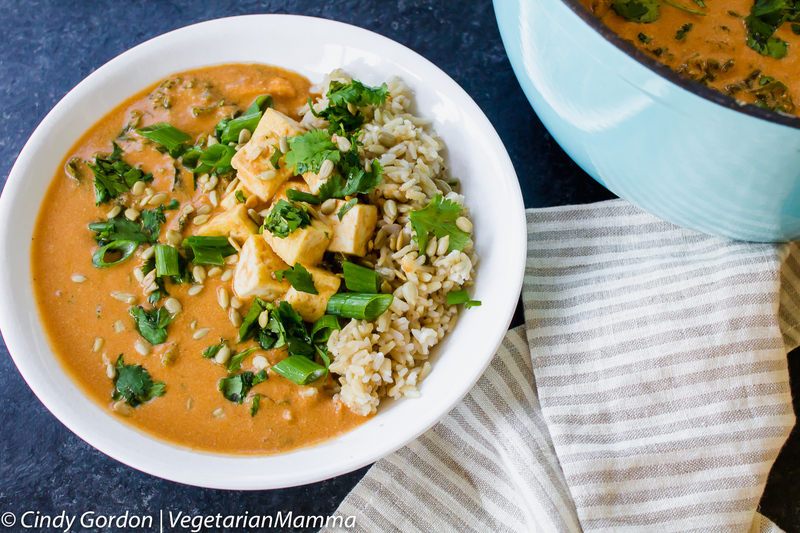 I have found this NUT-FREE African Peanut Stew (really peanutless!) is fast becoming a total comfort meal in my home. We have had some pretty cold weather here in Ohio, this winter. That is the delicious sunseed spread that I added to the soup recipe to make it nut-free. This is a nut-free recipe that you are going to love! Even if you have a peanut butter lover in the house, they will not notice the difference! That’s okay, if you do not like kale. If you like collard greens you can sub them in for this recipe. Those are the two greens that I would recommend. The greens need to be sturdy in the soup. Spinach for example, would wilt and become too soft for this soup. So stick with kale or collard greens as a secondary option. 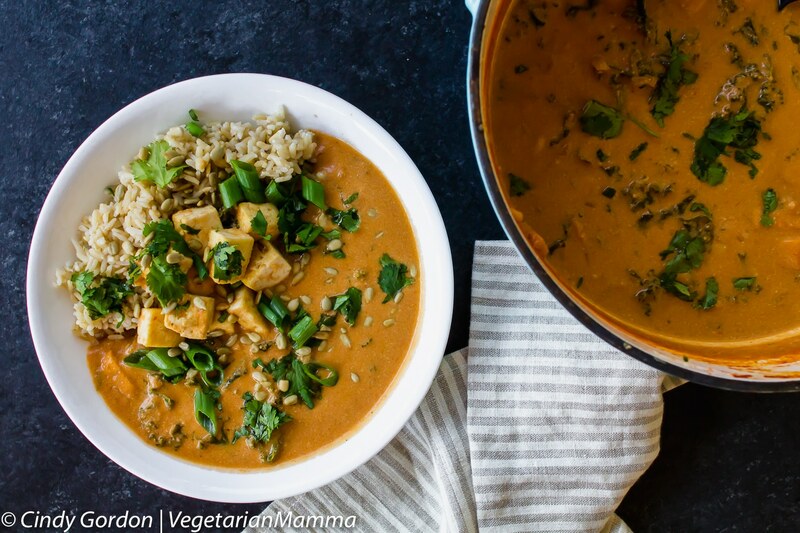 I have not actually tried to make this in the instant pot, but I am sure you could. 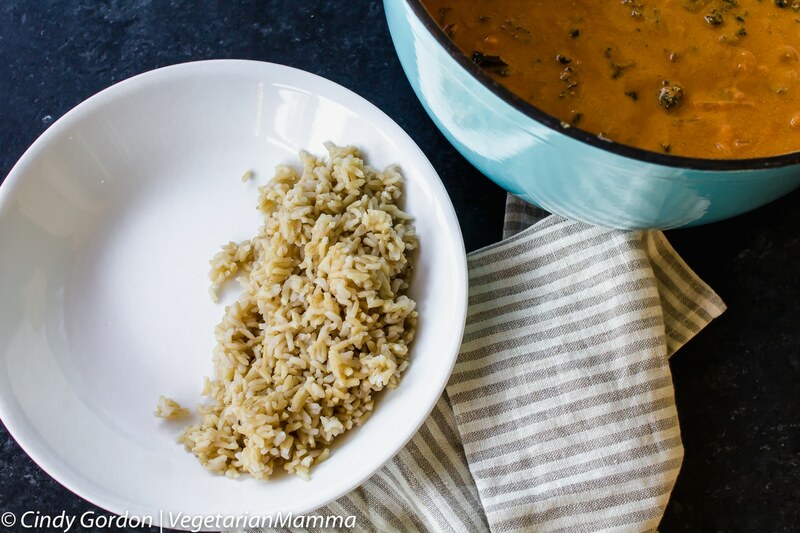 If you are a seasoned instant pot user, you should have success with a few adaptions to this recipe. 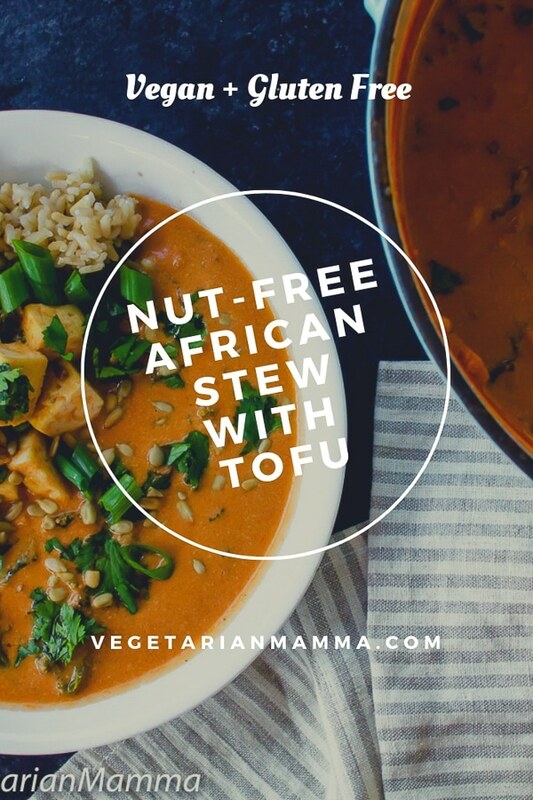 Can you freeze this nut-free west African stew recipe? Yes, you can freeze it. However, I would suggest that you freeze it without the tofu and without the rice. Make those two items fresh when you want to serve your thawed soup. Do I need to use vegetable broth? It is not necessary that you use vegetable broth, but it does increase the flavor of the soup. If you are looking to cut back on sodium which is frequently found in vegetable broth, you are welcome to use water. But keep in mind that it will be less flavorful. You could sub in some coconut milk (from the can) as well. I would sub equal parts of water and canned coconut milk. I am not a fan of rice. If you do not like rice, you do not need to add it to this dish. You can easily sub in quinoa! 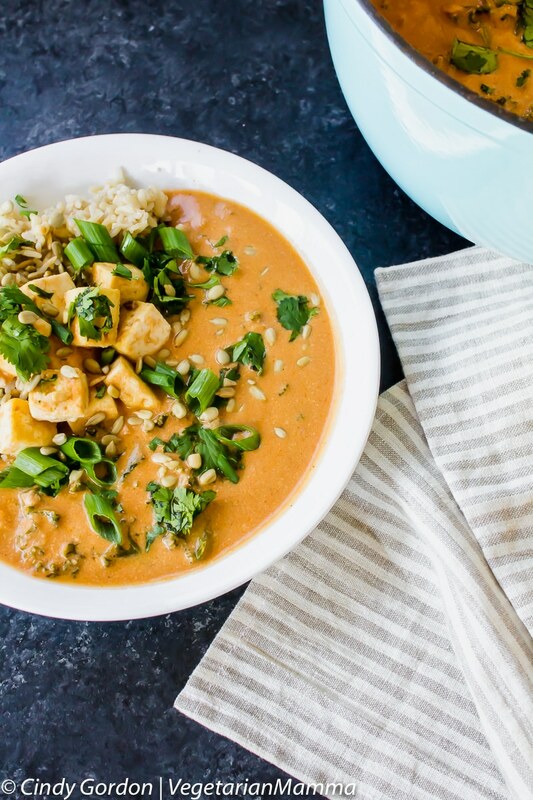 Pin this Nut-Free Peanut Soup for later! In a large soup pot over medium heat, warm 1 T of oil. Saute the ginger, onion and sweet potato. Add the garlic salt and cumin to the pot. Stir to combine. Toss in the kale and allow to wilt. In a small bowl mix together the SunButter and vegetable broth. Then add to the pot. Bring to a boil and cook until sweet potatoes are soft. In a skillet, heat the reaming oil saute the pressed tofu cubes until golden brown. Set aside. Divide the cooked rice into four equal bowls. Top with soup. Then divide the tofu into four bowls. 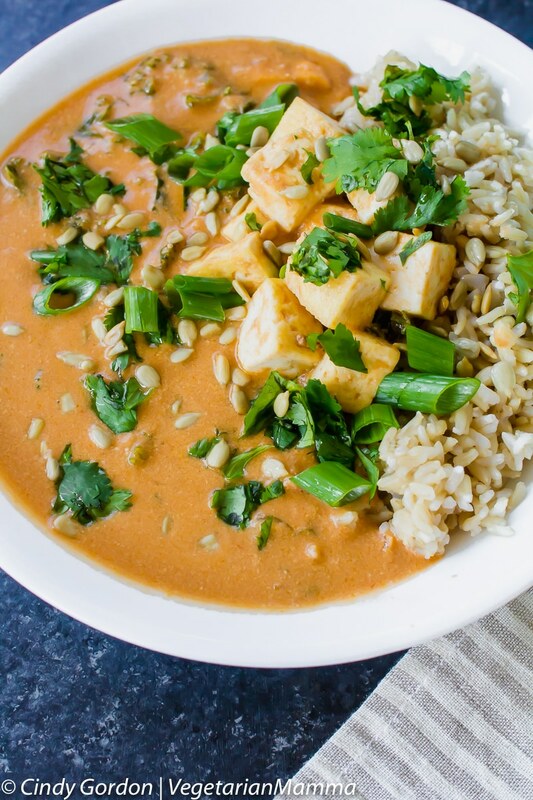 Garnish with sunflower seeds and cilantro! ENJOY! You are welcome to use an immersion blender to blend the soup if you'd like a smoother feel. Otherwise, enjoy the chunky comfort of those sweet potatoes! 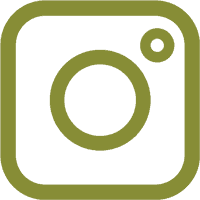 Let’s talk! Have you ever tried SunButter? Let me know your thoughts! Agreed, perfect for this chilly weekend! Wow this stew looks like the real comfort meal winner! Love all the colours and flavours in it. 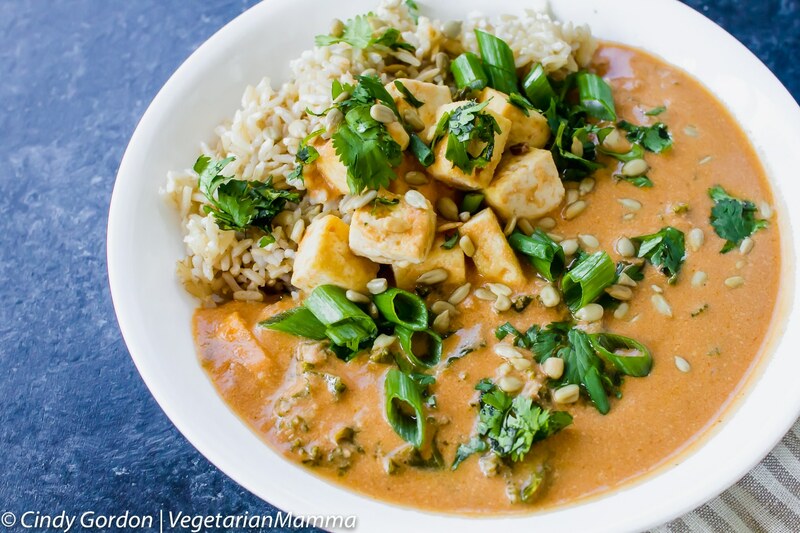 This stew looks yummy, creamy and healthy. Perfect Dinner platter for my loved ones. They to surely enjoy this dish. We love sunbutter! Been using it since I joined the military almost a decade ago; this is such a great peanut substitute! We love SunButter too! 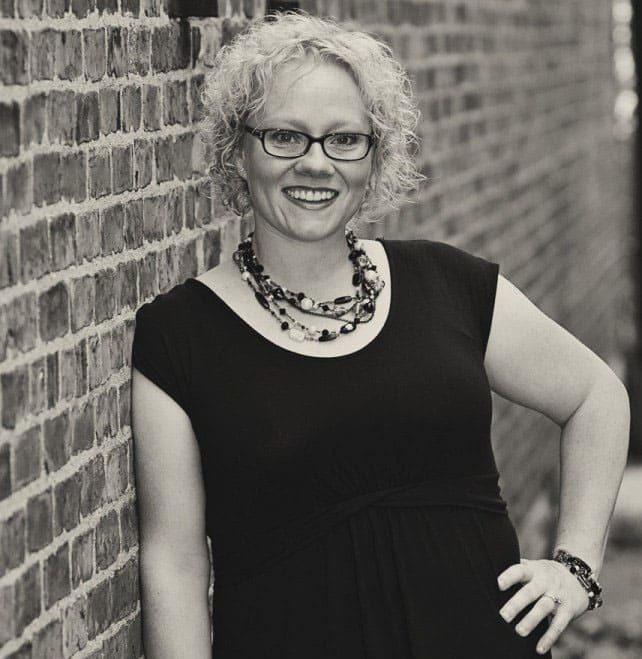 Such a great sub!